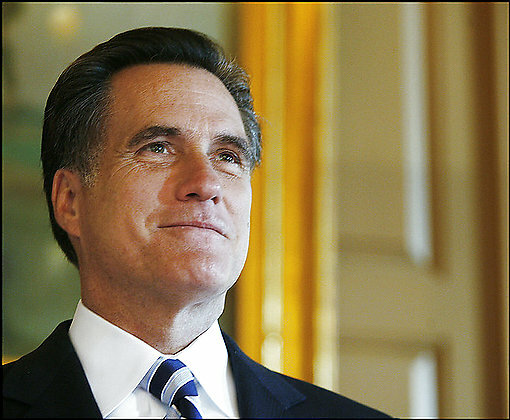 Is Romney’s Mormon Base A Mixed Blessing? So asks the Washington Post’s Alec MacGillis, in a lengthy article, dealing with whether or not members of the Mormon Church constitute a substantial political base, and whether that’s a good thing. There was no great mystery why Romney was in town. The former Massachusetts governor is a Mormon, as are about one-quarter of Idaho residents, including Ipsen and many others who turned out for the lunchtime event. The fundraiser was bracketed by two others in the Mountain West: one in Las Vegas and another outside Phoenix. At both of those events, Mormons made up at least half the crowd, organizers said. Altogether, the two-day swing brought in well over $1 million for Romney. As he vies for a place in the top tier of contenders for the Republican nomination, Romney is reaping enormous benefits from being part of a growing religion that has traditionally emphasized civic engagement and mutual support. Mormons are fueling his strong fundraising operation, which this week reported raising $21 million, the most of any Republican candidate. And they are laying the foundation for a potent grass-roots network — including a cadre of young church members experienced in door-to-door missions who say they are looking forward to hitting the streets for him. But, is there a downside to these potential Mormons for Mitt? Are some members uneasy because they fear a backlash of anti-Mormon bias or innuendo? But the intensity of this support has a potential downside as Romney tries to establish an identity separate from a religion still regarded warily by many Americans — a quarter of whom, polls suggest, do not want a Mormon president. Romney’s fellow Mormons also find themselves in a bind. In dozens of interviews, Mormons across the country said they are excited by Romney’s candidacy and eager to do what they can for him, just like members of other religious or ethnic groups with favorite-son candidates. Yet they are also hesitant to state their support too strongly, to avoid provoking anti-Mormon bias or violating church rules against politicking inside church walls. There has been an active and very vocal anti-Mormon movement in the United States since 1820. I can’t imagine those Mormons who are committed to a Romney candidacy are going to be deterred by fear of anti-Mormon activity. In fact, there’s already been a great deal of negative and anti-Mormon bigotry exhibited in this campaign. See here and here. I’m sure the potential for it to get worse is always there. A breakdown of the donors who gave the $21 million — $6 million more than former New York mayor Rudolph W. Giuliani, his nearest competitor — will not be available for another 10 days. And Romney’s political action committees, which have accumulated $8 million since 2004, have received substantial amounts from non-Mormons such as former colleagues in Boston finance circles, friends and associates in Michigan, where he grew up, and from business executives such as eBay chief executive Meg Whitman and Compuware founder Peter Karmanos. But based on the fundraising he conducted before this year, Romney’s other sectors of support are likely to be dwarfed by the backing he is receiving from LDS members. Wealthy Mormons giving to Romney’s PACs include the Marriotts, the Bethesda-based hotel family, who have given more than $390,000; the family of Jon Huntsman Sr., the owner of a major Utah chemical company, which has given more than $170,000; and the family of Utah Jazz owner Larry H. Miller, which has given $100,000. Also giving heavily have been thousands of rank-and-file church members. After Romney last fall sent direct-mail solicitations to Republicans nationwide, his two biggest state-level PACs received 319 checks from Utah, which is about two-thirds Mormon — a third of the total number of checks he received in the year’s final quarter. In the same period, he received seven checks from Massachusetts, where he has lived more than 30 years. Romney’s campaign edged against these boundaries last fall when Kem Gardner, a Utah developer whose family has given $140,000 to Romney’s PACs, set up a meeting in Salt Lake City with a church apostle, a Romney consultant and one of Romney’s sons. Documents obtained by the Boston Globe showed that the apostle, Elder Jeffrey R. Holland, suggested promoting Romney via the alumni association of the business school at church-owned Brigham Young University, a group with 5,500 members in 40 chapters. Days later, two deans from the business school sent an e-mail rallying support for Romney to 150 members of the school’s advisory council and 50 chapter leaders of the alumni association, the Management Society. Because it is legally part of church-owned BYU, the society is also prohibited from backing candidates. After the Globe reported on the efforts in October, church leaders disavowed any campaign on Romney’s behalf. I blogged about this episode just after it first broke. In the first post over at the Bloggernacle Times, I pointed out that the emails relied upon by the Boston Globe did not state what the Globe claimed. The only fair conclusion based on the actual facts is that clearly the Romney campaign had some lose cannons; but, there was never any Church involvement at the levels of leadership claimed by the Globe. In the other post at the Bloggernacle Times I also pointed out further flaws in the Globe’s follow up editorial on the subject, again attempting to link the Church to the Romney campaign. How unfortunate MacGillis relied on the sloppy reporting of the Globe rather than do his own fact checking. This description fits the Management Society. Society chapter leaders around the country say they discourage fellow members or guest speakers from making direct appeals on behalf of Romney or other candidates during their chapters’ monthly luncheons. But inevitably, lines blur somewhat, members say . . .
Creer, a security systems executive, did not return calls. A member of the chapter’s board, Phil Richards, said that it was no surprise society members would be raising money for Romney but that they tried to keep that separate. Overall I thought MacGills wrote a fairly well balanced article, other than the Boston Globe portion. It is increasingly clear that Romney’s campaign will be the conduit whereby greater and greater media light will shine on the Church. Again, I think this is a good thing. The Church has a great many strong and positive points that I think will reflect favorably in that increasing light.